Although the traditional treat for the festive Jewish holiday of Purim is Hamantashen (the triangle shaped poppy seed, jam filled or prune filled cookie), I thought it might be nice to enjoy something different this year. You'll love these little goodies and they're so easy to make. The children will enjoy helping you roll the balls up and rolling them in the powdered sugar. This recipe comes from the Jewish Holiday Feasts Cookbook by Louise Fiszer and Jeannette Ferrary. These are wonderful as candy or cookies, after dinner or with wine. 1. 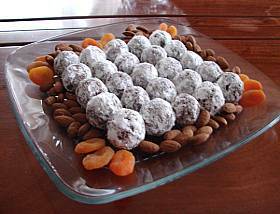 In a food processor, process apricots, the toasted and cooled whole almonds and chocolate until very finely chopped. 2. In a medium saucepan over medium-high heat, cook sugar and water until soft ball stage, approximately 240°F/115°C (approximately 10 minutes). 3. Stir in apricot mixture and cool. 4. Squeeze mixture together with hands to form a firm ball. 5. Using approximately 1 tablespoon of the mixture, form into 1-inch balls. 6. Roll each ball in powdered sugar. 7. Place in candy cups or place balls on an attractive serving plate. Recipe makes approximately 48 balls.